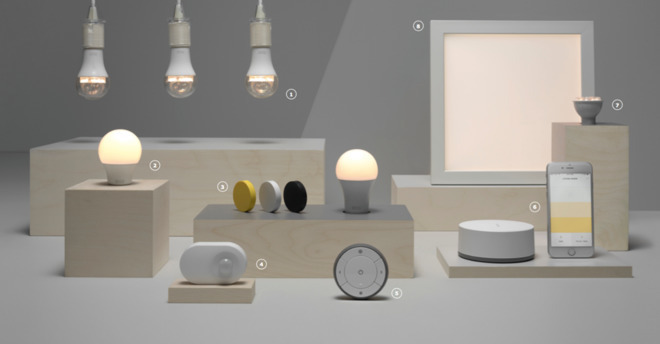 Home furnishings vendor IKEA has once again had to retract claims of Apple HomeKit support for Tradfri, its range of smartbulbs and related accessories. The company tried rolling out support for both HomeKit and Amazon Alexa to Tradfri owners Wednesday, but later said in a blog post that it had identified "technical difficulties," according to German site SmartDroid. IKEA noted that it's hoping to solve problems quickly. It briefly announced HomeKit support in August, only to go back on that statement within a matter of hours. The Tradfri lineup includes a range of bulbs, control units, and motion sensors —but at the moment, the only option for third-party control involves a Philips Hue hub. When the support eventually works, Tradfri could become one of the cheapest options for HomeKit lighting. A "Gateway" kit with a hub, two bulbs, and a remote costs $79.99, and individual bulbs range between $7.99 and $19.99, undercutting offerings from the likes of Philips and LIFX. One difference is that while all three companies offer white bulbs, Philips and LIFX have more expensive color-changing options as well. HomeKit allows devices from different manufacturers to controlled via Siri, watchOS, and the iOS Home app. This centralization also lets them be merged into automated "scenes," triggered by the time of day, device presence, or other conditions.